Yes, it’s Wednesday. And yes, this is Tax Tip Tuesday. However, I am but a weak (yet Funny) Accountant who can do nothing about which day of the week it is when seized by the urge to write, create and educate! Which brings us to today’s topic, something everyone seems to be talking about these days…daycare (and things our Provincial Government is doing to make our lives just a bit more difficult…)!!! My wife @MamaKujo (shameless plug – adventuresofmamakujo.blogspot.com) and I went through weeks of painstaking research to find a home daycare for our Rosie when the time was right. Obviously a caring, safe environment was our top priority but given that we live in Quebec and have access to the $7/day subsidized daycare system, this is where we focused our search. Lo and behold, Farah’s Daycare! A former elementary school teacher with 15+ years of experience, Farah runs the Hampstead-based home daycare with great affection. I mean, for ChristPete’s sake, she squeezes fresh juice for the children on a daily basis! We have since moved Rose into a larger, school-type environment since she’s now pushing 2-years-old but we remember Farah with fondness and have in fact recommended her to several new parents. Which is one of the many reasons why it saddens me that Farah will soon be fired. 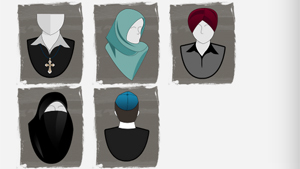 As many of you are aware, under the proposed Quebec Charter of Values, public sector employees would be banned from wearing a hijab, turban, kippa, large visible crucifix or other “ostentatious” religious symbols while on the job. This includes everyone from civil servants to daycare workers, teachers, provincial court judges, police, health-care personnel, municipal employees and university staff. While there are many disturbing aspects of this proposed legislation, it often takes a narrow look to see the big picture. Farah was born and raised in Iran and wears a hijab (a head-covering traditionally worn by Muslim women). Suffice it to say, she wears the head-covering for religious reasons and Provincial government legislation is not going to stop this practice. 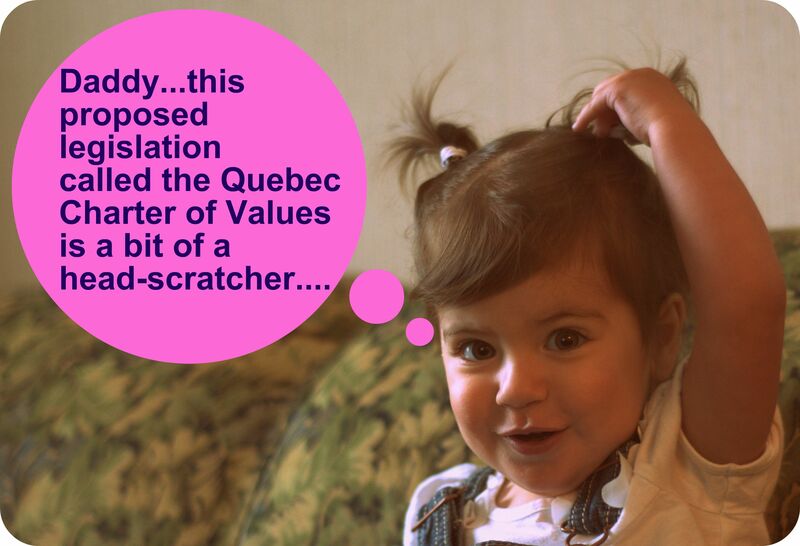 Should the new Quebec Charter of Values eventually become law, Farah will lose her daycare licence and her livelihood. Her daughters, currently working as assistants to their mother at the daycare and who themselves wear hijab, will lose their jobs and be unable to work anywhere else in the daycare system. It’s up to us as Quebecers, Canadians and humans to prevent the implementation of this proposal in any form. Write articles, write blog posts, send your local MNA some cookies and a love letter, whatever it takes! As always, if you have tax questions, need advice on your personal taxes, corporate taxes or anything else accounting or business related, please contact The Funny Accountant/President of MK & Associates at mitch@mkassociates.ca. Love this blog! As for the charter, I thought inciting hatred was a crime! Why sre Marois and her ‘henchmen’ not being arrested and charged? You don’t foster equality by legislating inequalities! Previous Post TTT – How to Pay More Tax! Nope, no joke. Yes, read on!